Topics: Just Like New Consignment, and Midway Skating Center. 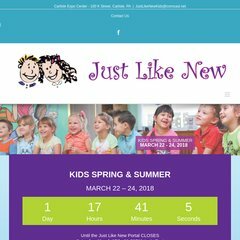 justlikenewkids.com Just Like New Kids - Central Pennsylvania&apos;s PREMIER Children&apos;s and .. It is hosted by Savvis Missouri, using Microsoft-IIS/6 web server. The site is programmed for ASP.NET. Its 3 nameservers are ns2.discountasp.net, ns1.discountasp.net, and ns3.discountasp.net. PING www. (216.177.83.7) 56(84) bytes of data. A ping to the server is timed at 47.7 ms.